You must make reservations at least 5 minutes in advance of the time at La Cigale French Bistro. La Cigale Bistro serves French cuisine and is located along West 4th Avenue, in Vancouver's Kitsilano neighbourhood. We focus on locally sourced, sustainable and seasonal ingredients that showcase the best of BC. 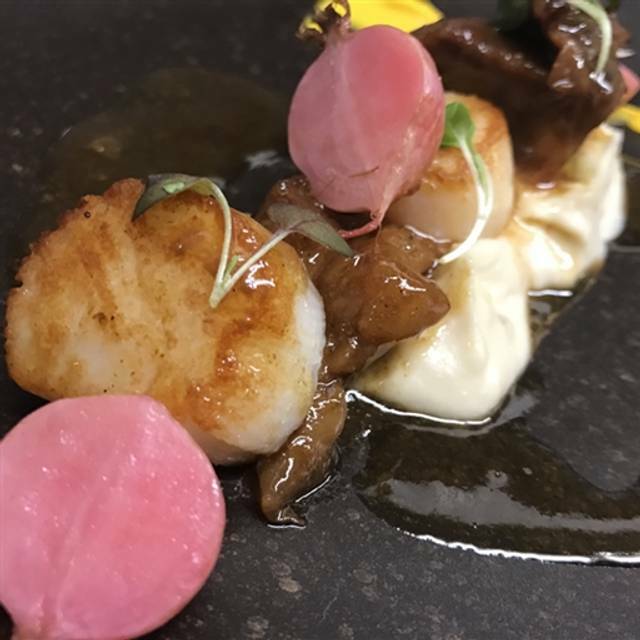 We strive to offer an authentic dining experience while using modern and innovative plating techniques. There was a party of about 25 male adults and they were making a lot of loud conversation. Although we were seated at the opposite end of the restaurant, we still had to speak loudly to my party of four to be heard. The restaurant had close to 40 guests dining, and there was only one waiter. He was pleasant and attentive, although a bit rushed. The food was good, consistently so, I have been there a few times within the last year. Tuesday evenings, you can bring your own wine with no corkage fee. Most restaurants do not have the selection of wines I like, and I like bringing my own bottle of wine. Overall, we had a pleasant evening despite the noise, which, to be fair to La Cigale Bistro, the din was unusual. That party of revellers was going to attend a special event across the street and that I understand was a very special event. The other times I had been to La Cigale Bistro, the noise levels were manageable. The Prix Fixe menu for a three course dinner ia an exceptional menu. They had all the choices available despite the crowd, and they were all consistently good. I would rate the food 3.0 to 4.5 stars out of 5 depending on choice. It's not Bishop's, but for the money, the one of best deals around, particularly on Tuesday evenings. Excellent service. Great quaint casual French restaurant! Would go there again! The fold was greater and overall experience good. Too bad we were there on a Saturday and couldn’t take advantage of the fixed price menu. My husband had the duck which was crispy and delicious. I had the steak frites which was huge! Portions are generous and wine great! Excellent meal, soup was amazing, lots of flavor. I went for the $32 3 course meal on Sunday night and it delivered. The French onion soup hit the spot, the duck was crispy and delicious, and the chocolate mousse was a nice end to the meal. I found the tart to have far too much cheese and not enough onions for a traditional onion tart. Excellent evening all round otherwise. Everything was perfect! One of the best meals I’ve had in a long time. Highly recommend the fixed menu from Sunday-to Thursday evening. We had a family brunch last Sunday. Everyone enjoyed their meal very much. The Pain Perdue was popular and delicious. Everything is freshly made and a cut above the ordinary! The service is excellent and we lingered over coffee. On a sunny winter day, it was perfect. The waiter provided impeccable service. The food was OK. Cigale Sandwich with the homemade fries was really good. The French Onion Soup was lacking in flavour, so that was a disappointment. The food was very good and portions was also very nice. We came for Valentine's day and the fixed menu was reasonably priced, which was quite different from some of the downtown restaurants. The food was delicious and the service friendly and attentive. What a great French restaurant in Kitsilano. Love their French onion soup!!!! Pre fix dinner is only $32.00. We had one of the best brunch meals we have had. The duck confit Benny's are a must and the unique French toast was devoured by our 9 year old. The omelette was excellent as well. Only thing better could be if that meal was in Paris! The food was delicious and well priced. The service was timely and helpful. The ambiance is cosy and welcoming. This restaurant is a neighbourhood gem. 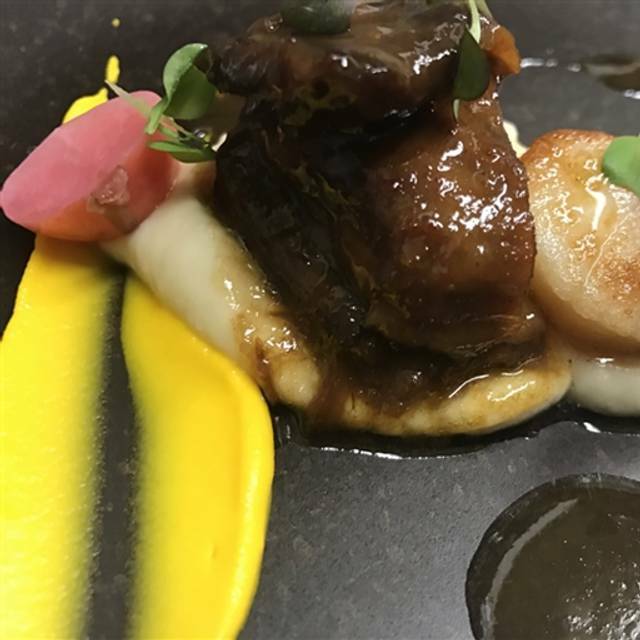 A limited menu with competently prepared dishes. All in all it doesn’t knock your socks off. More could be done to improve the decor. prix fixe menu available sunday-thursday is an excellent value. duck was outstanding. chocolate mousse was superb. Food and service plus doable noise level. An excellent French restaurant with reasonable price. Good food, good service, and quiet. You can actually have a conversation in that place. The price is excellent for the quality. I warmly recommend the place. Cigale was a fantastic surprise! The food and service were both amazing. A hidden gem!! Excellent place to eat brunch or dinner. So far I have tried the French onion soup, baguette, duck, omelette and French toast. All tastes great with surprisingly large portions and arrives hot so it is clearly fresh out of the kitchen. Coffee tastes a little acidic with an after taste from what I am used to; perhaps suits a different pallette. Service was very attentive. My water never went empty. Wonderful French cuisine and there was no rush at this restaurant. We took our time eating and enjoying each other's company. A good find indeed and highly recommended. A delicious meal and great service. The only downside was the music. Please get more variety! The duck was particularly fabulous. Nice french bistro on the casual side. They have a very reasonably priced prix fixe menu. The food was very good for the price. We had escargot and liver for appetizers and for the main course we had the duck and beef cheeks. The food was very good and service excellent. Unfortunately there was a large party there and the noise was deafening. Could not even carry on a conversation due to the noise and left early. Very good French comfort food - onion soup is delicious so is the onion tarte. For a main course have the beef cheeks or duck confit! Tuesdays are especially great as their is no wine corkage fee! Yeh! The service was excellent. La Cigale is a small and under-appreciated French Bistro in the Kitsilano neighborhood of Vancouver. Wonderful mussels and fries in an herb crème sauce, perfectly cooked filet mignon topped with a blue cheese crust, and a crispy skinned duck leg and thigh on a bed of cassoulet. The cassoulet was strangely sweet, but the rest of the meal was totally delicious. Have a bottle of a reasonably priced bottle of local Canadian or French wine. An excellent bargain for a French Bistro in Vancouver. A taxi from downtown will cost $10-$15. I started with the cauliflower grated, which was rich and delicious and definitely a dish to share. I tried some of my friends side salad, which was also delicious and a meal size, not really a starter. My husband had the escargot, which he enjoyed. 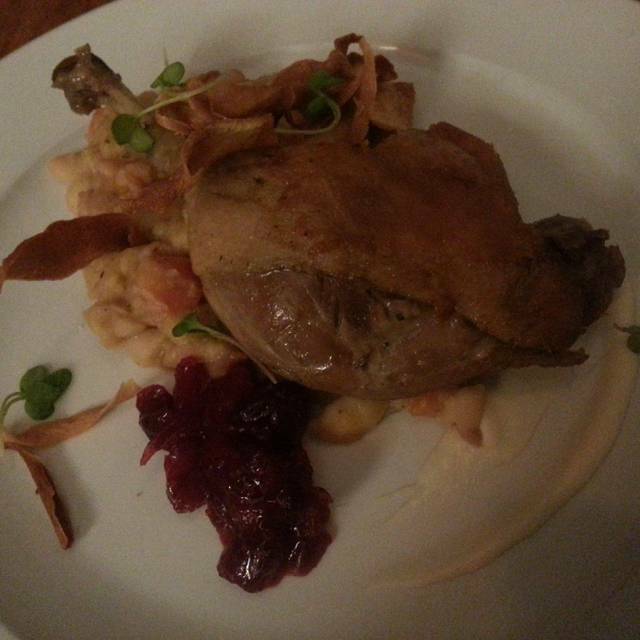 I had the duck confit, which was very good. It was very flavourful and moist, which can be hard to do with duck. A very filling meal. 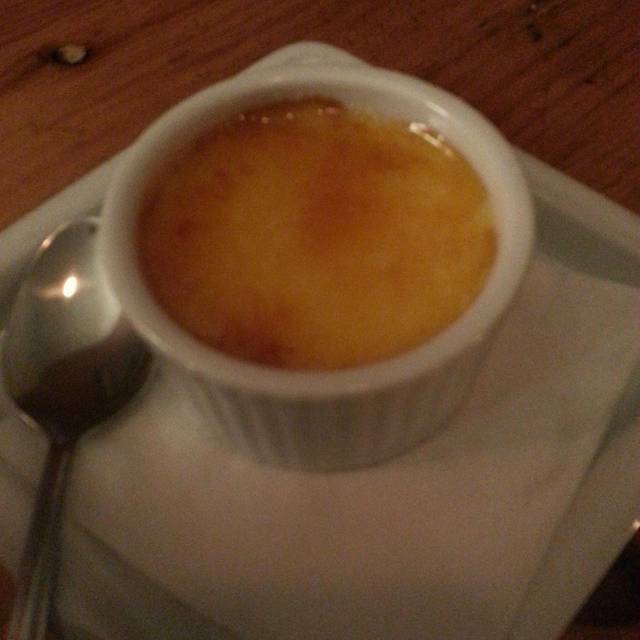 Despite being very full, we all shared a crime brûlée, which we didn’t regret. The wine list had a good selection of nice wines. Our server was very knowledgeable and made great suggestions for our table. She did a great job. We were surprised it wasn’t busier, it’s a great place. It was our first time there, but we’ll be back. 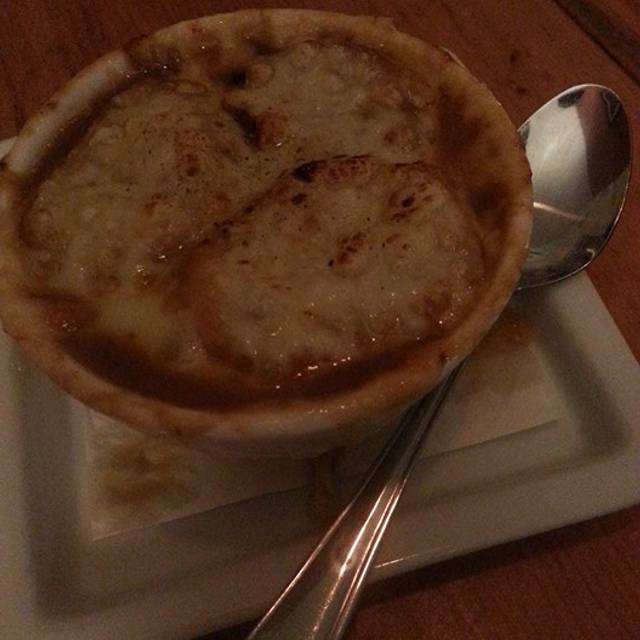 Server was lovely and the fresh baked french bread was great, but the french onion soup was bland. The soup bowl looks like it is covered with real cheese, but it is actually three slices of bread topped with only a minuscule amount of flavourless cheese, floating on top of mushy boiled onions. I was so hoping for the delicious gooey cheese topped, tasty french onion soup I once had in Montreal and this unfortunately did not come anywhere close. Love love love!!! First time eating here and I can’t say enough. Best French Onion soup ever. Beef cheeks and mashed potatoes to die for!!!!! An amazing hidden gem of an authentic French restaurant. One of the best in Vancouver. The baguette is the best I have tasted. The French Onion soup is excellent. It is slightly salty for my taste. That is why the 4 stars. Otherwise, 5 stars. Another great evening spent with good food, wine and friends. Wonderful neighbourhood location with authentic French Bistrot food. Would recommend it for someone looking for french cuisine. Service was fast and very friendly. We showed up early and they seated us immediately! The only real downside was something that the restaurant could not control I think. It was hot where we sat nearer the kitchen. If I had a do over I would sit closer to the front, at least in the summer. All in all, a very nice experience.